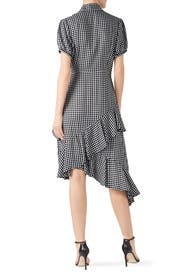 A tie neckline and cascading ruffles lend ladylike appeal to this timeless plaid dress by Great Jones. Black printed twill (100% Rayon). Hourglass. Short sleeves. V-neckline. Exposed back zipper closure. 39" from shoulder to shortest hemline, 46.5" from shoulder to longest hemline. Imported. 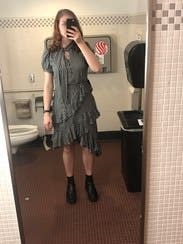 This was a super comfy dress to run around town in. My girlfriend did ask me if we were going to milk cows when I first put it on. 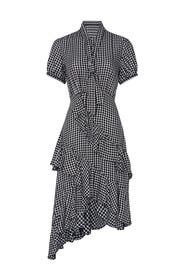 Easy to wear feminine dress with flirty ruffles. I received so many compliments. It's a bit high waisted so I put a black leather belt around waist and it was perfect! Accented the dress for everyday with red flat slides and the Gia Quinto bucket bag! 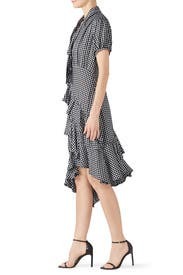 Could dress it up with scrappy sandals. I listed this as running small. It could just be me though. I found that the arm band was a little tight, but my arms are a little muscular. 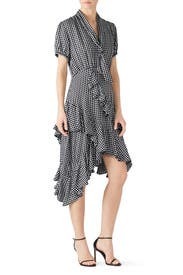 I love the ruffles and hemline of this dress. It flows beautifully. My only complaint about it is- the buttons at the neckline are REALLY difficult to undo. It took me 20 minutes to get 3 of them undone. They are just really tight button and loop closures.